Short mat is held Monday and Friday afternoons at Costin Hall in Lantzville for approximately 3 hours per session until the last week of April 2019 on a drop-in basis ‒ no commitment required. Two 10-end games are played throughout the afternoon, with a tea/coffee break between. Please bring your lawn bowls (or borrow ours if you are new to the game) a desire to have fun, and an occasional contribution to the snack pool. There are three mats, so up to 24 players can be accommodated for each game. Mondays and Fridays afternoons beginning of October to Easter. Doors open at 1 p.m.
Names in by 1:15 p.m. for the first game to commence by 1:30 p.m. Please arrive at least 15 minutes early to help with set up. Also, your assistance in take down is vitally important. The event is run by the volunteers and everyone needs to do their bit. $5 per session or $3.00 per session if a member of Seaside Community Society ($15). 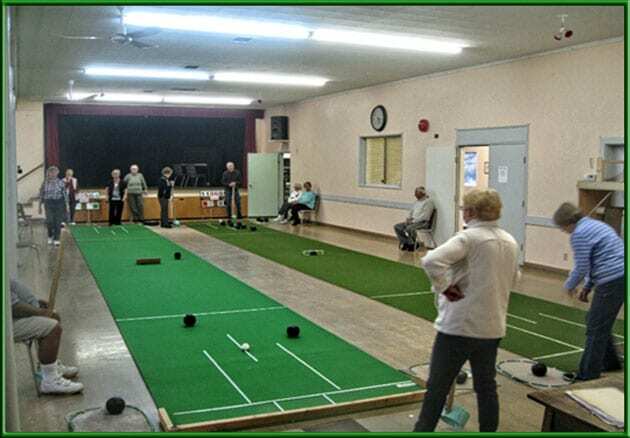 We have a lot of fun and it is a great way to spend the winter whilst all the time keeping in touch with fellow lawn bowlers until the Spring lawn bowling season starts again. Come and give it a try; come have some fun!